The Voivodeship Administrative Court in Warsaw in its judgment of 2 June 2009 case file VI SA/Wa 502/09 ruled that the examination of the novelty of an industrial design consists of carrying out a comparative analysis of various elements of a solution included in the opposed design and the industrial design applied for the registration and next, indicating of the existing differences and resolving what is their nature. 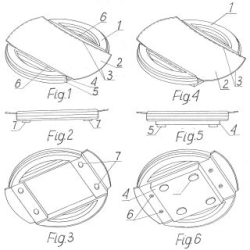 This judgment concerned the industrial design “Zestaw podstawek reklamowych Ring Fala” (in English: Set of advertising coasters Ring Fala), Rp-11780. See also “Polish regulations on industrial designs” and “Polish case law on industrial designs“. Categories: Art. 102 IPL | industrial designs | novelty of an industrial design | Polish Act on Industrial Property Law | Polish courts | Polish law | Voivodeship Administrative Court.